Lord and Lady Bunny Almost Royalty by Polly Horvath. The Sequel to Mr. and Mrs. Bunny Detectives Extraordinaire!. Review: Have you ever dreamed about becoming royalty? If you want to be a prince or princess, a duke or duchess, the king or the queen, Mrs. Bunny, from Lord and Lady Bunny Almost Royalty written by Polly Horvath, knows how you feel. Lord and Lady Bunny Almost Royalty is the second book in the series; the first book is Mr. and Mrs. Bunny Detectives Extraordinaire. Mrs. Bunny wants to be the queen, Madeline wants to go to an expensive school, Flo wants to sell candy, and Mildred wants to sell veggies. How can everyone get what they want? By going to England! There Mrs. Bunny can be crowned, and Flo can earn money by selling candy at the candy shop his relatives left for him. With the money Flo makes, Mildred can buy land to grow and sell veggies, and with the money Mildred makes, Madeline can go to college! But everyone will need a lot of help; luckily they have Catherine, Madeline's best friend, Mr. Bunny, Mrs. Bunny's husband, and Mrs. Treaclebunny, Mr. and Mrs. Bunny's annoying neighbor. So will Mrs. Bunny be queen? Will Flo's candy shop be successful enough so Mildred can buy the land? Will Mildred's veggies earn enough money so Madeline can go to college? The only way you will ever find out is by reading Lord and Lady Bunny Almost Royalty. Lord and Lady Bunny Almost Royalty, as I mentioned earlier, is the second book in the series, the first book is called is Mr. and Mrs. Bunny Detectives Extraordinaire. You will miss a lot of the character development by skipping the first book, so you might want to start there. This book is recommended for ages 8 to 12 but some of the 8 and 9 year olds might have trouble understanding some of the more advanced vocabulary Mr. Bunny uses, but the older kids should be able to read and understand the whole story. Also, younger kids may not understand the monarchy roles or the people that are references such as Prince Charles and Queen Elizabeth. This could cause a little confusion because in several of the 18 charters, they play an important role. So if they don't know the people, they won't understand they story. 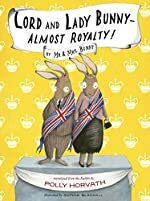 All together Lord and Lady Bunny Almost Royalty is a great book for a range of people, boys, girls, 8 year-olds to 12 year-olds, but is definitely more suited to advanced readers who have an interest in English royalty. Certainly the plot is one that any reader would love, so I recommend Lord and Lady Bunny Almost Royalty. We would like to thank Random House for providing a copy of Lord and Lady Bunny Almost Royalty for this review. Have you read Lord and Lady Bunny Almost Royalty? How would you rate it?